Sanchem's SafeGard® CC-3400 RoHS compliant chromate-free chemical conversion coating that leaves an electrically conductive clear to gold protective surface treatment on magnesium. You can use this SafeGard magnesium pretreatment to have excellent adhesion with paints, e-coats, powder coatings, and adhesives. Sanchem's metal pretreatments can be cold applied, hot applied, heat curable, or electrolytic applied conversion coatings. Application Temperature room temp. room temp. room temp. room temp. room temp. 190-200F room temp. Magnesium is a very reactive metal so salt spray tests according to ASTM B-117 are not generally run. The corrosion resistance of chromate conversion coated magnesium is less than 24 hours and there are no specified bare salt spray corrosion tests for magnesium. Most common chromate treatments for magnesium per SAE-AMS-M-3171 (supersedes Mil-M-3171): Type I (Dow 1) chromate, Type III (Dow 7) dichromate, Type IV (Dow 9) anodize, Type VI (Dow 19) chromate, and Type VIII: Chromate Treatment conversion coating all claim to have only fair corrosion resistance (less than 24 hours 20% salt spray resistance). These are mainly used for protecting magnesium during shipment, storage, and machining or as a paint base. We recommend SafeGard CC-3400 for these applications: to enhance paint and adhesives adhesion to the surface, and for protecting magnesium during shipment, storage, and machining. SafeGard 3400Mg - is a RoHS compliant chromate free chemical conversion coating that will give you better paint and adhesive adhesion then hexavalent chromate conversion coating. SafeGard CC is not affected by heat and will not dry out and mudcrack the way standard chromate conversion coating do. This conversion coating quickly reacts with magnesium to create a protective barrier. The SafeGard process is easy to control and can be applied by spray, brush, or dip. SafeGard CC-Seal#2 is a reactive seal that can be used with SafeGard CC-3400 to improve the corrosion resistance of magnesium. This magnesium seal coating actually reacts and bonds with the magnesium. Therefore, it will not wash off at the car wash, in high humidity or by the ocean. Most plating/painting treatments for magnesium alloys are corrosive to magnesium. The best way to prevent corrosion is by providing a barrier between the metal substrate and the environment. A coating has to be uniform, adherent, pore and crack free. The high reactivity of magnesium alloys causes the formation of a natural oxide when the metal is in contact with air and water. Proper cleaning and removal of these oxides and then surface passivation is necessary before any successful, long lasting powder coating, painting, electroplating, and electroless plating treatment can be produced. One of the best coatings for magnesium is electroless nickel coatings (EN), which are used as protective layers against wear and corrosion of the substrate. The process previously used on magnesium required a zinc transition layer created by a double alkaline zincate treatment followed by a cyanide copper strike layer in order to provide a uniform coverage. SafeGard EN-MG is an easy to use long life mid-phosphate electroless nickel strike bath for use on magnesium and magnesium alloys. The SafeGard EN-MG is specifically designed to be used in conjunction with the SafeGard Plating Catalyst to give you excellent corrosion resistance. These products are chromate-free, cyanide –free and do not use old, costly, ineffective, zincate technology. SafeGard CC- Plating Catalyst can replace traditional time consuming zincate and copper strikes with an easy to use fast acting single stage plating seal that is used as a base coat for both standard nickel and electrolysis nickel when plating over aluminum, magnesium, beryllium, niobium, and titanium. ** Long bath life: will give you l0 – 12 metal turnovers. ** Solution is self-pH regulating and as a result requires very little if any pH adjustment. ** Use SafeGard EN-MGMU and water for make-up. Use SafeGard EN-MGAD to replenish tank. 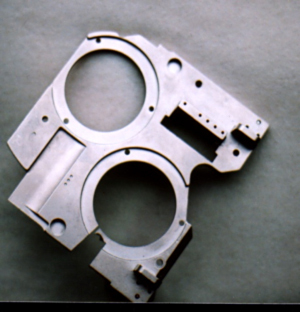 The magnesium castings weigh 67% of the weight of aluminum and have more strength than plastics. The major drawback to using magnesium until now has been finishing it. With the SafeGard CC-plating catalyst with SafeGard ENMU system the problems of poor salt spray corrosion and poor adhesion upon baking the plated part are just a bad memory. With the SafeGard ENMU system, electroless nickel advantages are uniform coating thickness, dense, ductile, superior corrosion resistance, electrically conductive, wear and abrasion resistance, high salt spray hours on magnesium substrates. If a higher quality surface appearance is required, acid copper can be easily applied over the ENMU surface. After SafeGard ENMU is applied and electroplated metal can be applied over it.